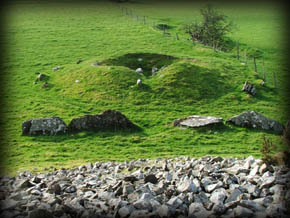 Of the thirteen cairns on Carnbane West cairns D and L are the largest, Cairn L can be easily identified from Carnbane East, it has an unusual entrance as can be seen in the image above. Cairn L is aligned with the cross quarter days 8th November and the 4th February. 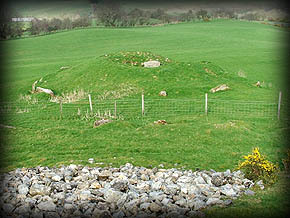 Originally this mound must have been huge, you can see by the kerbstones on the image shown left, that most of the cairn has now gone. 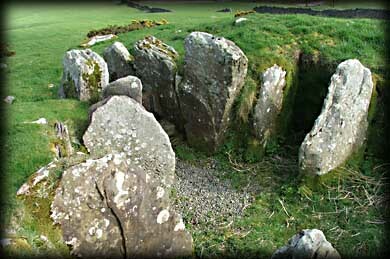 This picture was taken from inside the chamber of Cairn I.
Cairn L. Latitude: 53° 44' 36" N. Longitude: 7° 8' 2" W.
The image shown left, was also taken from inside the open chamber of Cairn I. Although Cairn H is not very big in diameter the passage and chambers of this small cairn feature some amazing passage tomb art. At least four of the stones of this mound bear inscribing. Some of this decoration is shown on page three. 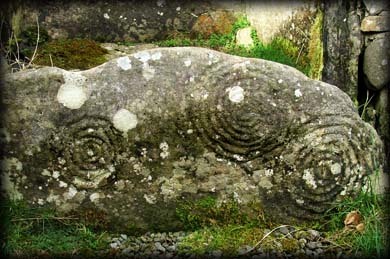 The picture right shows some of the spirals that are inscribed on a sillstone, stone 1. The excavations of cairn H found bone objects decorated in the La Tene art style. This cairn is aligned to indicate the cross quarter day the 8th November. 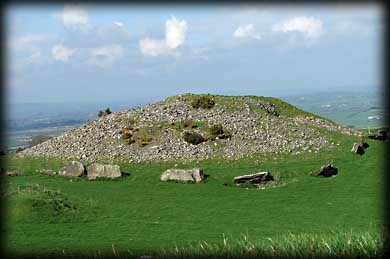 Cairn H. Latitude: 53° 44' 35" N. Longitude: 7° 8' 4" W.
The mound just South of Cairn L is known as Cairn I, as with most of the cairns at Loughcrew this tomb also features rock art. This passage is aligned to indicate the Autumnal equinox 23 September. 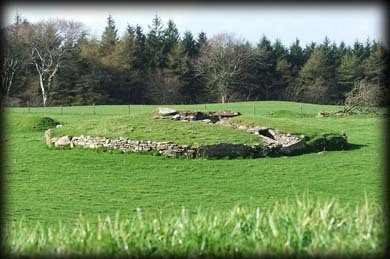 If you look straight out of the passage you will see Cairn T on Carnbane East directly in front of you. 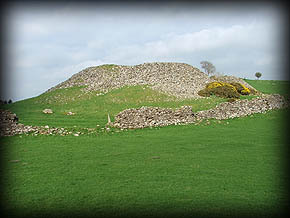 Cairn I. Latitude: 53° 44' 33" N. Longitude: 7° 8' 3" W.
The Cairns are all identified with numbers, the ones on Carnbane West are numbered, from West to East A2, C, A3, B, A, D, G, F, I, H, J, L and K. pictured right is cairn J viewed from the top of Cairn L and the bottom image is Cairn K also from seen from the top of Cairn L. Without doubt the biggest cairn at Loughcrew is Cairn D on Carnbane West, pictured below. Cairn J. Latitude: 53° 44' 36" N. Longitude: 7° 8' 4" W.
A passage or chamber has never been found at Cairn D even though the Archaeologist Conwell spent weeks during 1868 removing tons of stones from the Cairn. I would imagine a lot of the cairn was also used to build the boundary walls seen in the image shown left. To really appreciate the megalithic complex at Loughcrew you would need to spend a day walking around the whole site discovering the wonderfully inscribed stones and taking time to take in the views offered from this megalithic landscape. Cairn D. Latitude: 53° 44' 33" N. Longitude: 7° 8' 11" W.
Situated: From Oldcastle take the R195 to Millbrook branch left and then take a right turn and take a narrow road up to a small car-park, during the summer months there may be a guide there to help, if not walk about 300 metres back up the road till you come to a large gate with a standing stone in the field to the right of the gate. Walk straight to the Cairns from this stone. Discovery Map 42. Last visit March 2005. Cairn K. Latitude: 53° 44' 37" N. Longitude: 7° 8' 1" W.